Many people spend night after night blighted by snoring or other sleep-related conditions such as sleep apnoea. Whether it is you or your partner who is the cause of these sleep-disrupting issues,Alexandra Dental can help to tackle your night-time troubles. Our dentists have undertaken further studies to be able to help patients affected by sleep issues. Snoring, is the sound resulting from vibrations of muscles as you breathe when sleeping. This is not harmful to your health but can affect your partner’s sleeping pattern. Sleep apnoea can severely affect your health. It is caused when your muscles relax and obstruct the windpipe, cutting off your oxygen supply. This obstruction can last for up to ten seconds and occur hundreds of times in a night, reducing blood oxygen levels and raising both your heart rate and blood pressure. 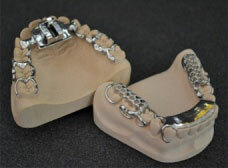 For those who snore or have mild sleep apnoea, we can create a removable device called a mandibular advancement splint. 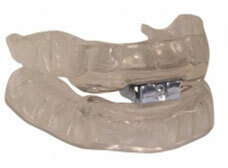 This is made from moulds of your mouth and is worn at night time. 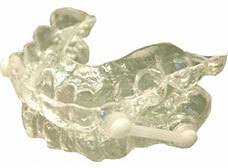 It keeps the jaw elevated and prevents the muscles from collapsing and blocking the airway when they relax. If you are affected by sleep issues and would like to arrange a consultation, please click here to contact us or call 01442 256335.